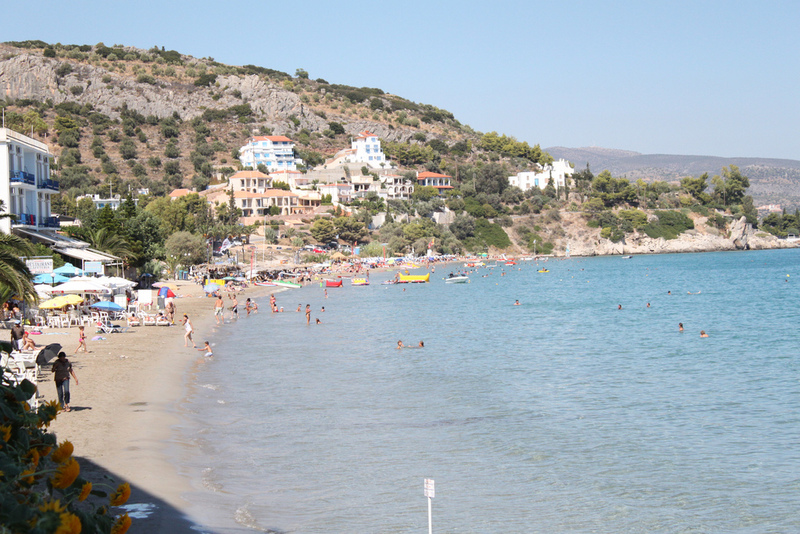 After leaving Olympia we headed to Tolon, Greece. We only spent one night in the area but it was truly magical with it’s clear waters and small, intimate streets and our hotel was situated perfectly near the water. While Stacy and I tried to make the most of our limited time by enjoying a swim in the ocean our mission for the evening was to find a place to wash our clothes. We had been hand washing our dedicates and t-shirts but a thorough cleaning was much needed. Our desk clerk told us where we could find a laundromat so we gathered up our garments and headed out into the night. This was more of an adventure than we had bargained for. We walked for quite a while without finding the supposed laundromat, when we finally found what we thought was our destination it was closed. We trudged back to our hotel defeated and resigned to wearing our not-so-good-smelling clothes a little while longer. You can’t stay down for too long when there is a bustling night life awaiting so Stacy and I headed to a bar with our tour guide, Giuseppe, where we ate baklava and drank wine until early morning. Not a bad way to forget your worries. I wish there would have been more time to spend in Tolon. It felt like a small, tight knit community that would welcome visitors with open arms. Perhaps this is why I gave up precious sleep to watch the sun rise over the ocean. I wanted to drink in as much of the area as I could before departing. 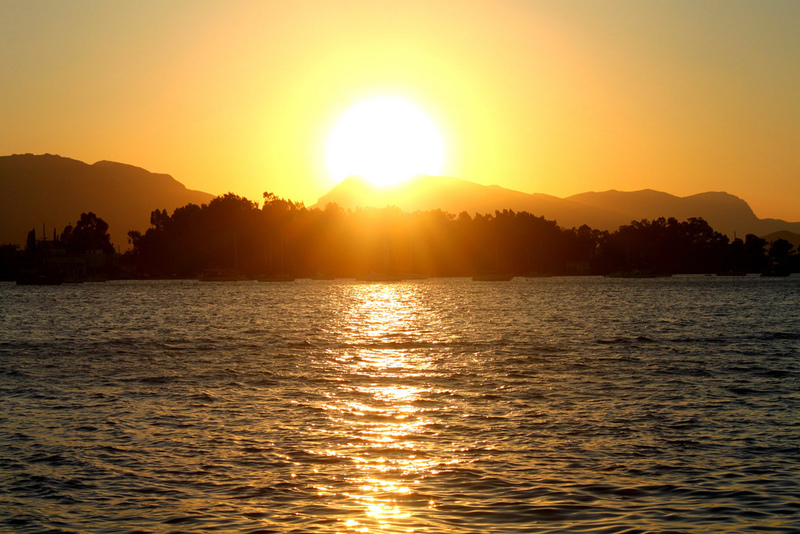 The sun rises over Tolon, Greece. Once my group members joined me, we had our breakfast and shuffled to the bus. Athens was the next and final stop of our tour. Before arriving in Athens we stopped to check out the ruins of Mycenae, which was once a major center of Greek civilization. In fact, the period of Greek history from approximately 1600 BC to around 1100 BC is referred to as the Mycenaean Period. 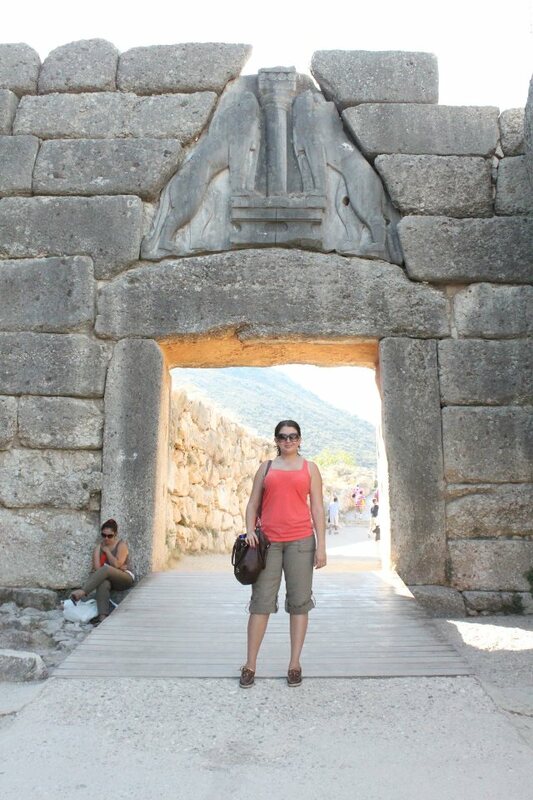 Me at the entrance of the Mycenae Ruins. 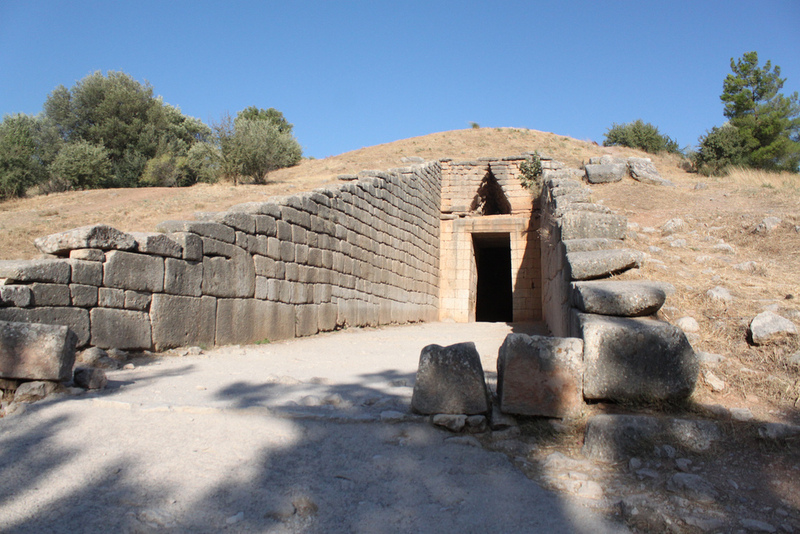 Located in the ruins is the Tomb of Agamemnon which is believed to have been constructed around 1250 B.C. It was awesome to see such a structure but nothing compared to being able to walk inside of this massive beehive-shaped piece of history. It was certainly a cool way to escape the hot, Greek sun in more ways than one. 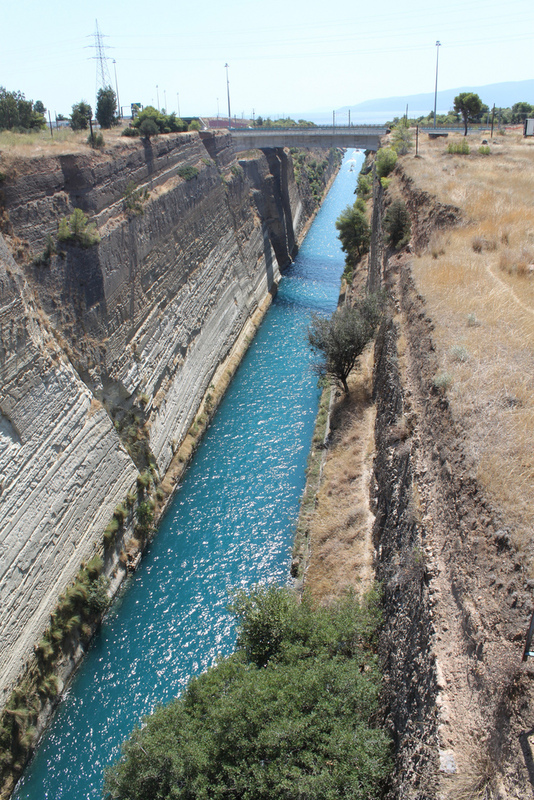 On our way to lunch we got to walk across the Corinth Canal where I saw what may possibly be bluest water in my life. The canal is four miles in length so beware if you are afraid of heights. That evening we arrived at the Coral Hotel in Athens which would be the final destination with our group. While the hotel isn’t in the city center its location is great with the both the train station and beach situated right across the street. With plenty of time left to the evening, Stacy and I took the train into the city. It was about a 15 minute ride which stopped at Syntagma Square, an ideal location to begin exploring. In front of the square is the Greek Parliament where the Tomb of the Unknown Soldier lay. Stacy and I enjoyed a nice dinner and took our time strolling in and out of shops before heading back to our hotel. As we walked back toward the train station we heard what sounded like chanting over bullhorns. At first I thought is was religious fanatics preaching but then it became clear that a protest of some sort was going on around us. I asked someone what was going on and he politely explained that citizens were protesting a tax increase. He assured me that this sort of thing happens often and is usually a peaceful demonstration. This is all I need to hear to stick around and see for myself. Stacy did not approve but agreed. 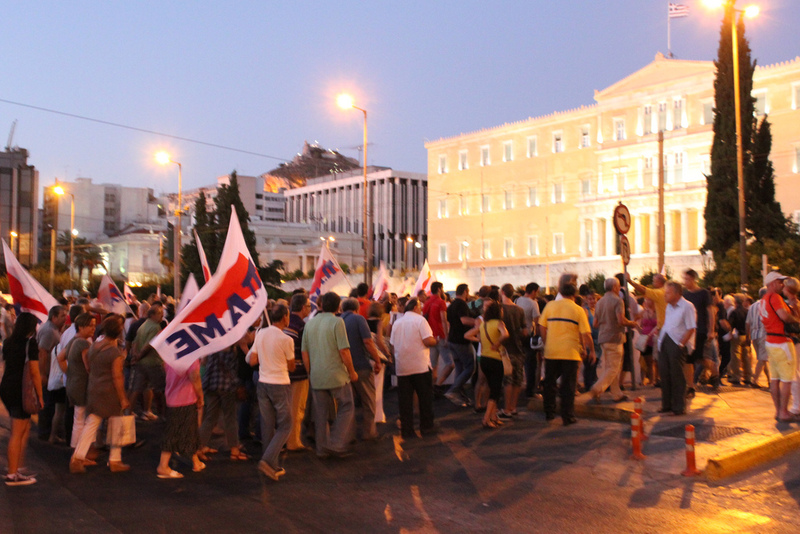 Throngs of people, young and old, gathered in Syntagma Square yelling and holding signs. It was certainly a sight to see if not somewhat overwhelming. I was watching citizens exercise their rights in the birthplace of democracy! It was something I am grateful to have witnessed and will never forget.